Bound in top-quality goatskin leather, this KJV Bible represents superlative quality for the most discerning Bible customers. The Concord Reference Edition offers a wealth of reference material – a glossary, concordance, dictionary of names and phrases, color maps and gazetteer. Bold-figure cross-references link passages of the text without cluttering the page. 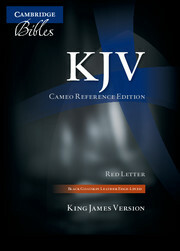 This style features black-letter text. In addition, a presentation page and family record, India paper, art-gilt edges, ribbon markers and a goatskin leather binding—edge-lined for maximum flexibility —make this an outstanding Bible. 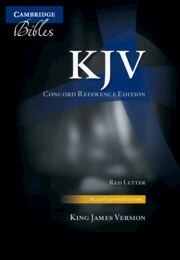 The Concord KJV is one of Cambridge's flagship Bibles. 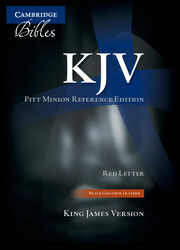 It is a good hand-sized Bible, yet the clear typesetting with the center column reference system makes it a joy to read. The India paper is opaque yet thin, keeping this Bible a very manageable size. I appreciate the plethora of reference materials when studying from this Bible. Cambridge's soft and supple goatskin and the art-gilt edges make this a beautifully appointed Bible. The only thing I wish was different would be to have it fully leather-lined. The polyurethane liner has a bit of a shiny finish that looks unnatural.